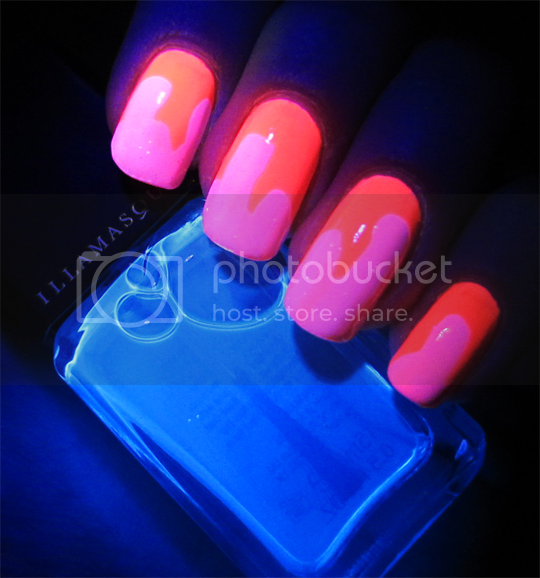 Last week, I posted about Illamasqua Omen, one of the three UV Nail Varnish shades from the new Paranormal collection. As much as I love the bright green colour, I was even more excited about the prospect of Illamasqua Geist* – this UV topcoat promises to give the same insanely reactive appearance to any nail polish when applied on top. Rather than just slap it on though, I thought it might be fun to try some ‘secret’ nail art with it! 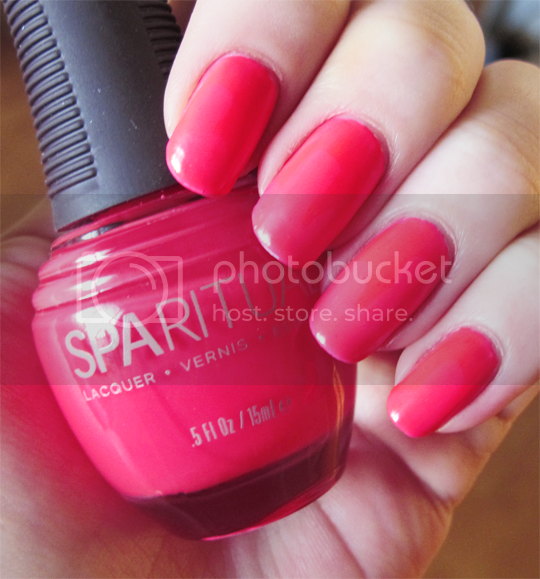 The colour I have used underneath is SpaRitual Dreamsicle. The photo below is horribly inaccurate – neons are a bugger to photograph! Imagine a little less red/coral, a little more in-yo-face true shocking pink. I wanted to go for something neon in the hope that it might also be a bit reactive under the UV light and it turned out to be a pretty good choice! In normal lighting, you can see below that NAME is a pretty standard neon pink (with an excellent formula, I might add, but one that I chose to apply over a layer of white to bring out the neon more and avoid needing too many coats. Neons, for those who don’t know, are notoriously hard to built up to full opacity). So, with my pink base in place, I just applied the dripping pattern with Illamasqua Geist the same way I have done in previous drip manicures (here and here!). It was a bit of a challenge since it’s clear so I couldn’t see what I was doing! 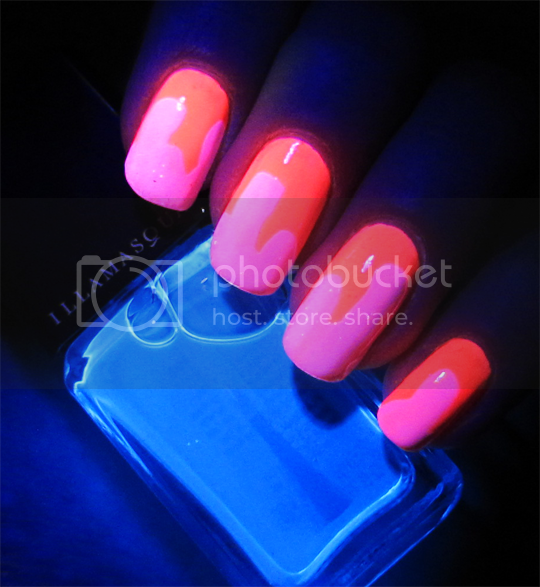 I just kept checking each nail under the UV light as I went along to check I was on the right track. Et voila, secret nail art! I think this is really fun. I like knowing that it’s not always visible! It’s worth knowing that Geist has a slight blue tint to it – not obvious in most lighting conditions but in bright sunlight, you can see the shape of the drips on my nails with a slight blue cast (you can sort of see it in the daylight shot). But of course, they don’t really come to life until you bust out the blacklight! Illamasqua Geist UV Nail Varnish is out today (30th April 2013) on counters and in standalone stores nationwide, as well as online where it costs £13. Totally worth getting as a fun addition to your collection, amazing for a night out – and a good excuse to try some secret nail art! I love Illamasqua. However, the drug store brand Miss Sporty have had a UV top coat available for ages, for the much more bank balance friendly price of £1.99 and it doesn’t leave any blue tint over existing polish either. It’s called Disco Tech.